In 2018 LOS TWANGS celebrate their fifteen birthday, preaching from Zaragoza, Spain, their mix of rock and roll, surf and garage, always from a FRAT spirit. Over those years they have release 3 Lps and half a dozen EPs and 45's, but their biological clock said a change was needed.The change came in the year 2016 with Esther, a girl with a great voice who leads the swing combo Swind Garret. 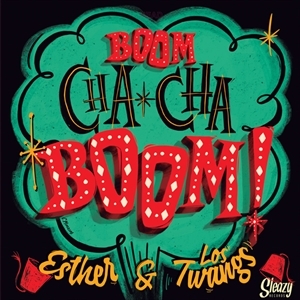 They joined forces by chance, first with the idea of making some collaborations and finally releasing a single by the end of 2016 at Sleazy Records that meant the true beginning of Esther & Los Twangs.Now the project of Esther with Los Twangs is consolidated with a new LP, titled BOOM CHA-CHA BOOM, in which youll find the usual rock'n'roll, garage and surf sounds that made them famous but also theres room for latin beats, rhythm & blues and also a pinch of European female 60s pop. But do not be fooled, the musical essence of The Twangs is still beating powerful in these grooves.